nVent CADDY: Fixing, fastening and support products for use in electrical installation, datacom, telecom, fire protection, seismic and HVAC applications. nVent ERICO: Grounding, bonding, lightning protection and electrical rail connection solutions for commercial, industrial, utility, rail, alternative energy and telecom end user groups. nVent ERIFLEX: Low voltage power and grounding connections for OEMs, panel builders and targeted industries. nVent LENTON: Engineered products for concrete reinforcing steel connections. The nVent CADDY Cat HP J-Hook System is an advanced, non-continuous pathway support solution for today's high-performance cabling systems. Highly engineered features help ensure a stable and secure installation that complies with industry codes and standards for high-performance cables. The nVent CADDY Cat HP System is a cost-effective alternative to using wire mesh cable tray, ladder tray or similar complex alternatives. It requires significantly less material and installs in a fraction of the time of other methods. This versatile solution accommodates a wide range of attachment methods and is available as individual J-Hooks, pre-built nVent CADDY Cat HP assemblies and multi-tiered trees, as well as interchangeable nVent CADDY Cat HP components. 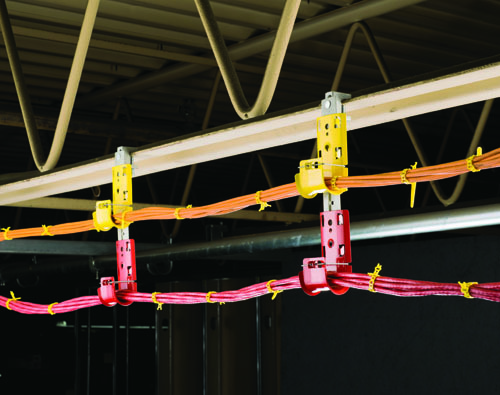 The nVent CADDY Cat HP J-Hook System provides the perfect combination of performance, time savings and versatility required by today's datacom and electrical contractors. Meets ISO®/IEC 14763-2, ANSI®/TIA 568 and ANSI®/TIA 569. Contact your local Accu-Tech representative to learn more about nVent CADDY and nVent ERICO solutions.